Indian shade grown coffee is always associated with one or the other multiple crops like Arecanut, Orange, Cardamom, Pepper, Oil palm, cocoa and banana. These multi crops grow luxuriantly along with Coffee and establish a symbiotic role where in one crop acts as an anchor to the other. 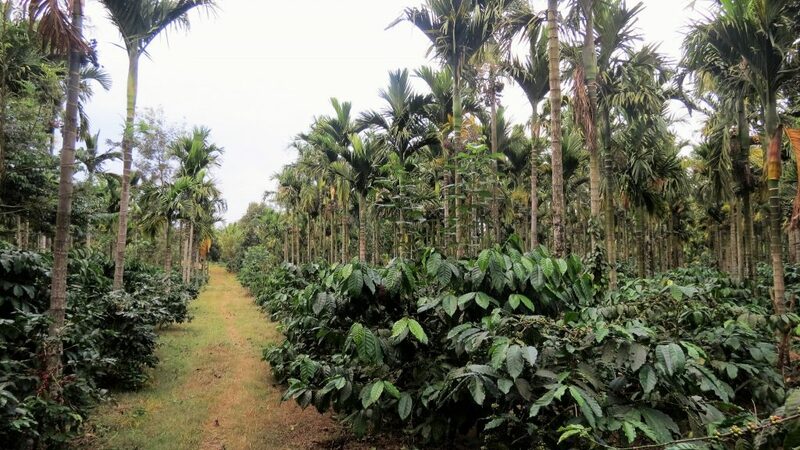 These multi crops also provide a unique taste to Indian Coffee because of the mutualistic and synergistic interaction of the root rhizosphere and endorhizosphere dynamics with that of Coffee. The areca provides filtered shade to coffee and the coffee ecosystem provides the much needed biotic component for the luxurious growth of areca. Additional income is generated by planting pepper on to the areca. More importantly, multi crops act as an insurance by providing a lifeline to the Coffee Planter in times of distress, especially when the prices of the second largest traded commodity in the world, namely Coffee, hits rock bottom. The interesting aspect is that Coffee provides a unique ecosystem where in many different multiple crops grow along with coffee without adversely affecting the coffee yields. This is made possible because of the differential root system of associated crops. 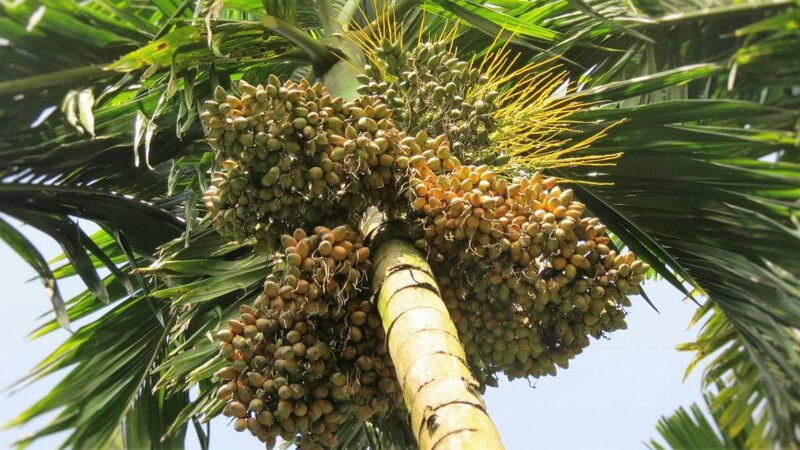 Arecanut being a highly profitable commercial plantation crop can be effortlessly inter planted in certain ecological niches within the coffee ecosystem in areas such as valleys, flooded areas and places with topography like steep valleys etc. Joe’s Sustainable Coffee Farm has introduced Arecanut cultivation along with Robusta, namely Selection Robusta variety S-274 and C x R.
This variety of coffee is the most widely used coffee across the major Robusta coffee growing regions, and is a selection that was made from the high yielding old Robusta coffee collection brought to India from Sri Lanka. The bushes of this coffee plant are strong and can be adapted across regions. The beans of S.274 coffee are bold, round and greyish in colour after wet processing. CxR coffee is a cross-breed between Coffea congenisis and Robusta coffee. The bushes of this coffee plant are more compact, with smaller and narrower leaves compared to conventional Robusta coffee plants. Beans of this variety of coffee are bold in size, with soft and neutral features in the cup, which sets them apart from conventional Robusta’s coffee. 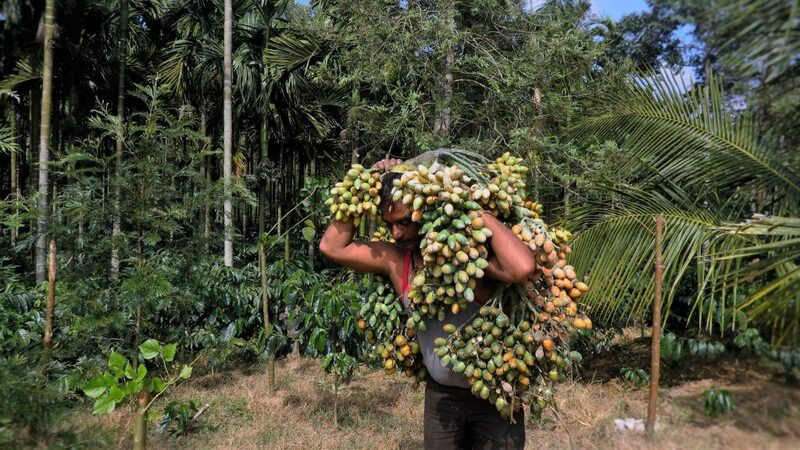 Arecanut is easily adapted to the Western Ghats where coffee is cultivated on a commercial scale. Generally, Coffee grows well within a temperature range of 21 degree centigrade right up to 32 degree centigrade. This aids arecanut cultivation too. 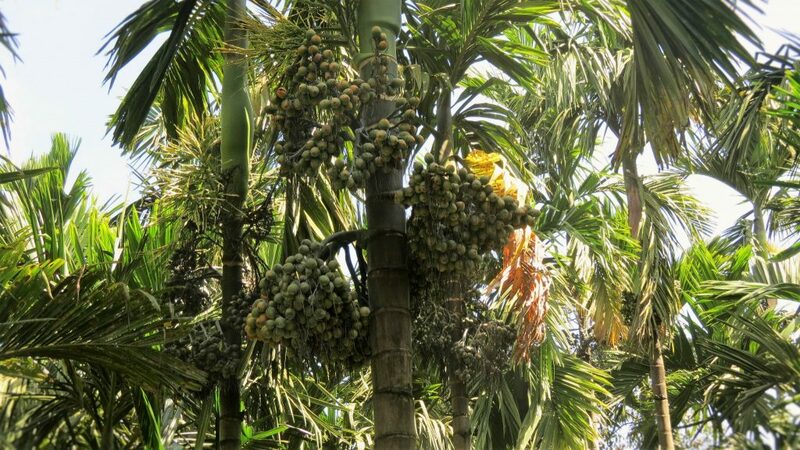 However Arecanut does not prefer higher elevations and grows best at 1000 to 1500 meters mean sea level. Hence, the Cultivation of areca is restricted to the lower elevations, preferably in valleys and low lying paddy fields. It can also tolerate heavy rainfall in the range of 750 to 4500 mm. The Coffee ecosystem is gifted with a wide variety of soils from sandy loam to clay and arecanut is capable of growing in most of the soils fit for coffee cultivation. Well drained soils is a prerequisite for the successful establishment of young plants and yields are also proportional to the extent of drainage and aeration provided in the soil system. As the young plants start growing, the root system starts growing closer to the soil surface and this exposure of roots to the sun is not a desirable trait. Hence, periodically, new soil has to be brought in to cover the root system. This aspect increases the cost of cultivation significantly. Areca requires soils which are neutral in hydrogen ion concentration and can withstand a ph range of 5.5 up to 6.5. Hence lime application is carried out every alternate year depending on the soil ph characteristics. 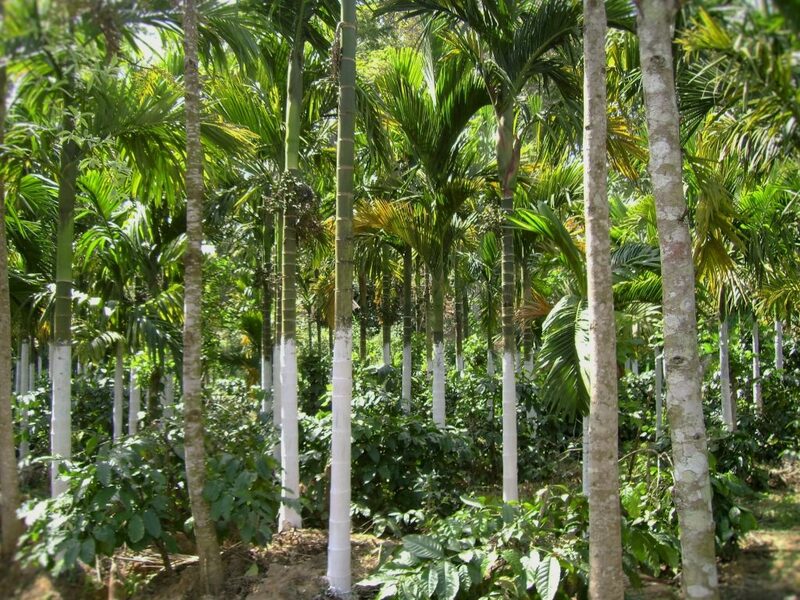 Since a significant portion of the areca cultivation inside Joe’s Ecofriendly coffee farm is restricted to wetlands, the soils are poor in nutrients and need to be improved in terms of texture , structure and nutrient status. We achieve this by cultivating different types of legumes like daincha and sesbania and ploughing them back into the soil 45 days after broadcasting the legume seed. The nitrogen fixing nodules in the legumes add on to the nitrogen pool and enrich the soil significantly. Generally, two varieties of arecanut are the main stay inside coffee, namely Theerthahalli and Mangala Variety. The Teerthahalli variety is a traditional variety and Mangala is a high yielding variety. The traditional variety is more drought tolerant and resistant to pests and diseases. 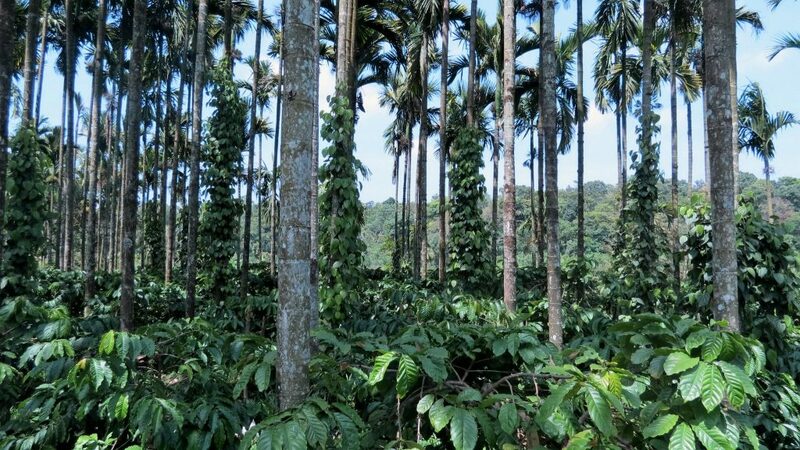 (High Yield Variety) Semi Tall Round, Small 3 – 4.5 Coastal Karnataka, Parts of Malnad. Young one year seedlings are planted in pits of about 90 cm x 90 cm x 90 cm at a spacing of 2.75 m either way and covered with soil to the collar level and pressed around. 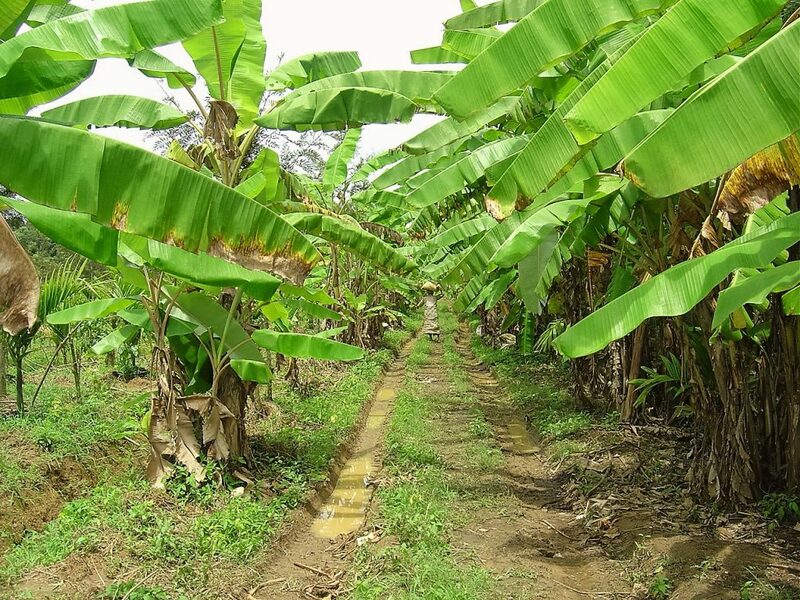 Providing shade during summer months during the first for years of establishment is a prerequisite and this can be provided with growing Banana or other crops in advance. In the initial years sowing castor seeds will also help. Areca responds extremely well to farm yard manure. Compost helps in the build-up of native soil enriching microorganisms and help in building up resistance to pests and diseases. It also enables the mined paddy soils in improving the water holding capacity. Adequate protection from exposure to South Western sun is very essential to avoid sun scorch. Applying lime up to three to four feet on the stem during summer months helps in the reflection of sunlight and protects the plants from sun scorch. Depending on the Eastern or Western slope, shade trees and wind barriers need to be put in place well in advance of planting young areaca seedlings. This enables quick establishment in the field without affecting the root system. Areca requires water during the summer months and cannot tolerate drought conditions even for a small period of time. 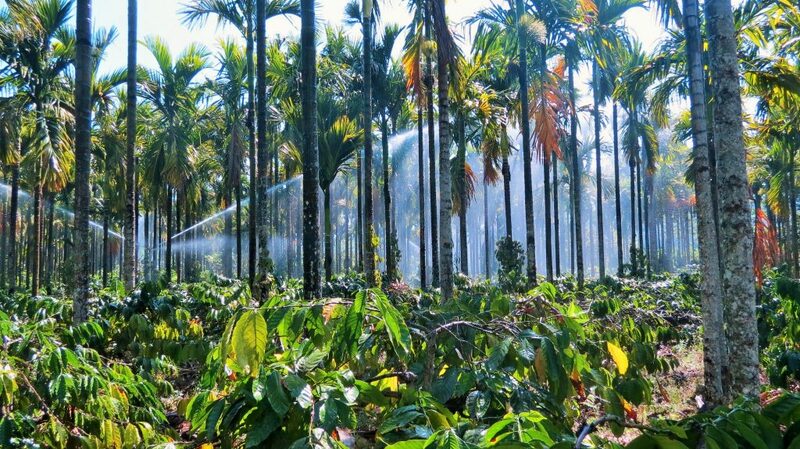 Hence small pop up sprinklers are permanently installed inside the coffee blocks inter planted with areca and irrigation is provided at weekly intervals. If streams or tank water is available, then flood irrigation can also be carried out. Generally, a full grown areca tree of 10 to 12 years requires 200 liters of water each day. Traditional areca varieties like Theerthahalli respond very well to farm yard manure application. At Joe’s sustainable farm we apply approximately 15 kg of compost along with neem seeds to each tree every alternate year and also apply two rounds of fertilizers with nitrogen, phosphorus and potash. Care is taken to reduce the nitrogenous fertilizers as the tree ages. 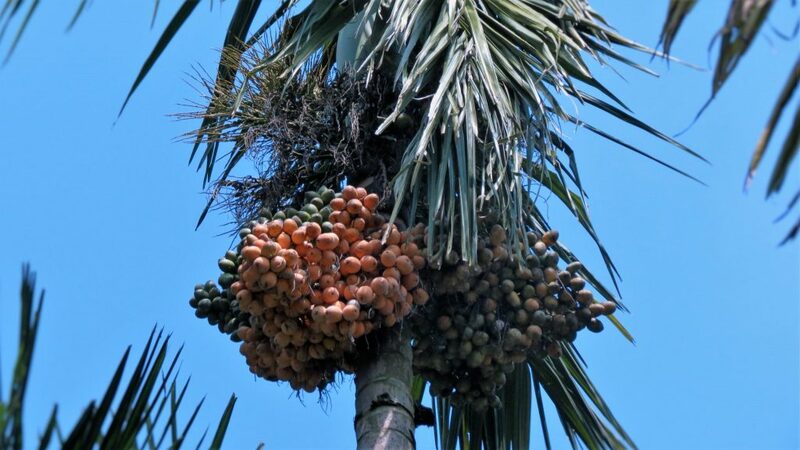 Areca trees above 5 years, fertilizer in the ratio of 100:40:140 g of NPK/ tree/ year can be applied. To palms less than five years old, half of the above dose is recommended. 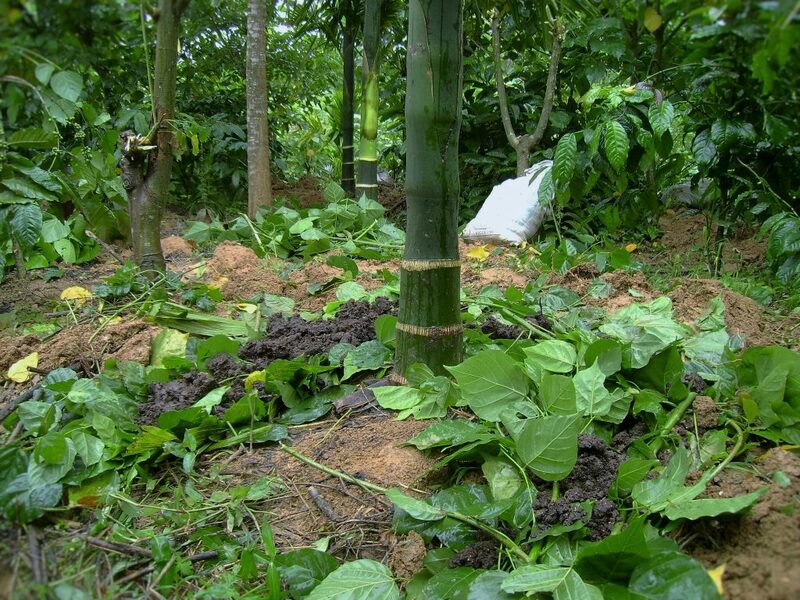 Manures are applied during summer and monsoon in a basin of 0.75-1.00 m radius around the tree to a depth of 20 – 30 cm. Once in 5 years, a circular pit, six inches in depth at a distance of three feet away from the areca stem is excavated and filled up with green manure, compost and covered with soil. Bud rot or Mahali disease ,Foot rot or Anabe, Yellow Leaf Disease, Leaf spot, Nut crack. We spray the trees with 1 per cent copper sulphate twice a year. First, just before the onset of the monsoon and second spray , 45 days after the first spray. The bearing starts after 5 to 8 years of planting depending on the Agro Climatic region. Nuts are harvested when they are three quarters ripe. The number of harvests will vary from three to five in one year depending upon the season and place of cultivation. An average of about 1000 to 1250 kg/ha can be obtained.